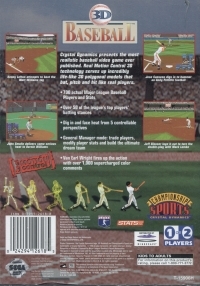 Box Text: Crystal Dynamics presents the most realistic baseball video game ever published. Real Motion Control 3D technology serves up incredibly life-like 3D polygonal models that bat, pitch and hit like real players. - 700 actual Major League Baseball Players and Stats. - Over 50 of the leagues top players' battling stances. - Dig in and face heat from 5 controllable perspectives. - General Manager mode: trade players, modify player stats and build the ultimate dream team. - Van Earl Wright fires up the action with over 1,000 supercharged color comments. 05-04-2012 scott Box Text Crystal Dynamics presents the most realistic baseball video game ever published. Real Motion Control 3D technology serves up incredibly life-like 3D polygonal models that bat, pitch and hit like real players. - 700 actual Major League Baseball Players and Stats. - Over 50 of the leagues top players' battling stances. - Dig in and face heat from 5 controllable perspectives. - General Manager mode: trade players, modify player stats and build the ultimate dream team. - Van Earl Wright fires up the action with over 1,000 supercharged color comments. 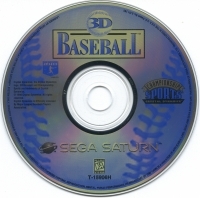 This is a list of VGCollect users who have 3D Baseball in their Collection. This is a list of VGCollect users who have 3D Baseball in their Sell List. 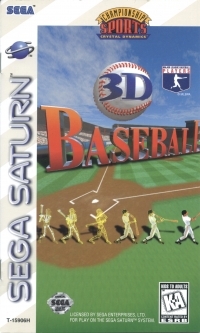 This is a list of VGCollect users who have 3D Baseball in their Wish List.